October is Light it Red for Dyslexia awareness month! With approximately 1 in 5 Australians on the Dyslexia continuum, Global Access feel it is important to raise awareness for those who struggle to read, write and spell on a daily basis. Light it Red for Dyslexia are a volunteer initiative to ‘light up’ significant monuments and landmarks across Australia in red to raise awareness of Dyslexia. You will know or have met someone who is Dyslexic and probably don’t even know it! A common misconception is that Dyslexia is limited to the flipping of letters when writing, or that it is a visual problem that can be corrected with glasses. Another is that it is an ailment that children have, but that will grow out of it once they hit their teens…. All of these are incorrect! Dyslexia is much more than flipping letters, Dyslexia CANNOT be corrected by glasses, and Dyslexia is a life-long trait. Dyslexics are just like everybody else, they’re good at some things, and not so good at others. Dyslexia is typically defined as Learning Difference in the area of Literacy in it’s entirety; Reading, Writing and Spelling. Often Dyslexics also struggle with Numeracy and may present with other co-morbid traits like ADHD, OCD and a few others. With the correct intervention, Dyslexics can learn to read (technically it’s called decoding) and write at a good level, albeit a little slower than most. The best intervention is Systematic, Explicit, Multi-Sensory teaching methods. Dyslexics learn at their optimum when information is conveyed in a visual way. Dyslexics are out of the box thinkers, and are extremely desirable in the workforce. Companies such as NASA and Goolge seek to employ people who have Dyslexia as they have what is often referred to as SUPER POWERS that are unique to Dyslexics. • Agatha Christie – Prolific Author …… And the list could go on! 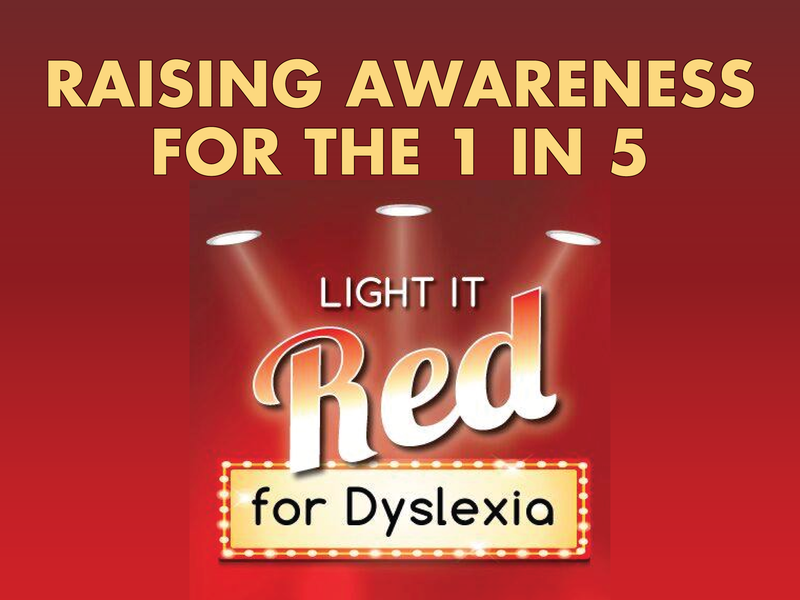 You too can help raise awareness of Dyslexia by visiting the ‘Light it Red for Dyslexia’ Facebook page an Liking and Sharing their page. Perhaps you or your business and even school would like to get involved, so shoot them a message!